Aretha Franklin, The Fray and Jim Gaffigan will also perform at Saturday's event on the Benjamin Franklin Parkway. 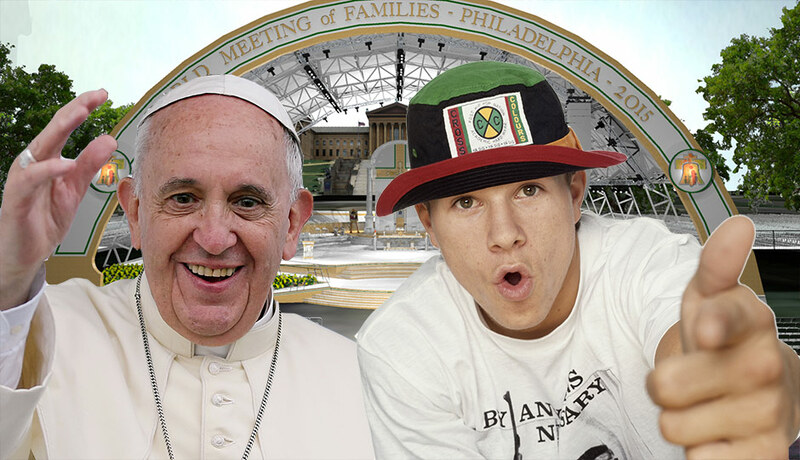 By Dan McQuade·	 9/14/2015, 3:34 p.m.
Mark Wahlberg will host the Festival of Families in Philadelphia the Saturday of Pope Francis‘ visit, the World Meeting of Families announced today. Queen of Soul Aretha Franklin, rock band The Fray and comedian Jim Gaffigan will perform during the event. ESM Productions, which is based in Two Penn Center and has planned large-scale events in Philadelphia previously, also released a short video of the stages at Independence Mall and on the Benjamin Franklin Parkway. The World Meeting of Families also released quotes from the other entertainers appearing next weekend. Wahlberg is a curious pick for the festival, given his history. While his image has since been rehabbed as a famous, serious actor, in his teens Wahlberg threw rocks at a group of teens and permanently blinded a man in 1988. In both cases, he allegedly shouted racial slurs. He was originally charged with attempted murder and pleaded guilty to two counts of criminal contempt. Wahlberg attempted to have his record expunged last year. Wahlberg, Franklin, The Fray and Gaffigan will be joining Andrea Bocelli, Juanes, Marie Miller, Matt Maher, Sister Sledge and the Philadelphia Orchestra (led by Yannick Nézet-Séguin) for the World Meeting of Families concert.